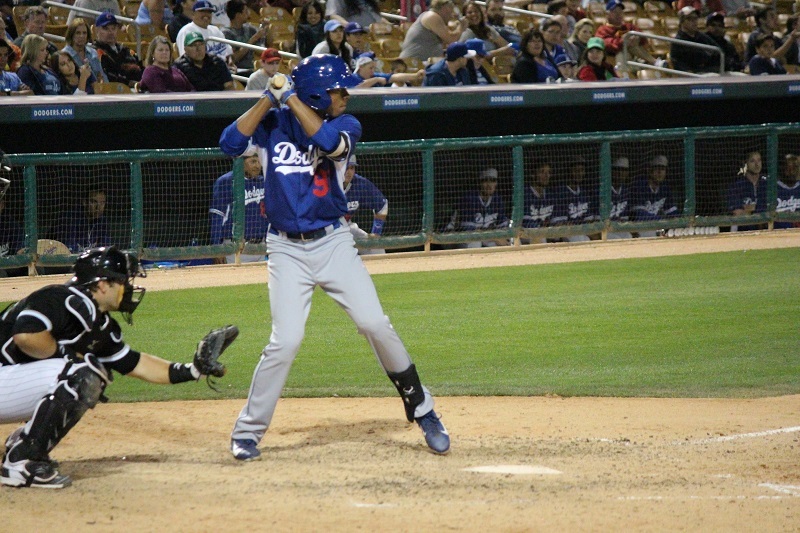 The Dodgers’ farm system is really strong, and this team should reflect that. There were a lot of strong performers in 2015. Some guys took steps forward, some took steps back and some are on the cusp of being the next wave of good prospects. To be eligible for this list, a player must have been prospect-eligible for the 2015 season. Ages are the age-season of the player, not their actual age. This team is based on 2015 minor-league performance and not necessarily a reflection of where they rank within the system. Age and competition level is also taken into account. – Before the season, I’d have bet many dollars this would have been Julian Leon, but he struggled mightily in the Midwest League. Instead, Barnes had a great offensive season with OKC and is even enjoying a cup of coffee in Los Angeles. He was a PCL All-Star, is clearly the best catching prospect in the system and had the best season of any catcher in the system. If he were a couple years younger, he could be a fringe Top-100 prospect. 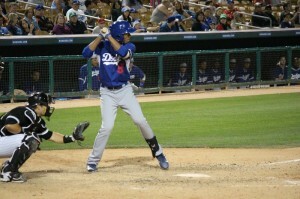 – My minor league player of the year, Bellinger showed tremendous power in his first taste of full-season ball. Sure, it was the California League, but he has the tools that could (should) translate as he progresses through the system. He was a Cal League All-Star and won the Cal League Championship MVP award. I’m excited to see what he can do in Double-A. – Trinkwon didn’t post the best overall numbers (especially after moving up to Double-A), but the Cal League All-Star had a solid line overall and just edges out Calhoun, who has done nothing but hit since being drafted. Trinkwon is a utility player at best in the majors, but I’d be surprised if he ever reached that ceiling. He should continue to be a good minor-league player. He’s slated to play in the Arizona Fall League. – The numbers look pretty decent until you realize he’s 24 and was old for the league. He only had six games in Double-A, so there isn’t a ton to draw from it, but Hoenecke isn’t much of a prospect at this rate. Third base is one of the weaker spots in the Dodger system. – A resurgent Scavuzzo found hitting in the Cal League is a lot easier than the Midwest League. Most of his production came while with the Quakes. He’s still young and toolsy, so there’s a chance he could figure things out going forward. He’ll have to prove he’s more than a product of his environment. He’ll face some of the game’s best prospects in the Arizona Fall League. – Verdugo got off to a rough start in the Midwest League. He had just a handful of appearances in the Pioneer League in his debut year, so jumping essentially a level is tough for young hitters. He was slashing .213/.254/.274 through the season’s first two months. From June 1 through the end of the minor-league season, he slashed .356/.380/.520 across the Midwest and California Leagues. His walk rate dipping as much as it did is a little alarming, so that’s something to keep an eye on. – Not often do current-year draftees make this list, but Garlick does because he hit the cover off the ball (also, there wasn’t really a worthy right fielder thanks to Scott Schebler‘s down statistical season at Triple-A). As an older player, it isn’t surprising to see him hit well, but he hit well at every level. Odds are he doesn’t have much of an MLB future, but it’s always fun to see a guy perform well the year he was drafted. – My MiLB pitcher of the year, De Leon had a great season overall. He dominated the Cal League and was promoted to Double-A after seven starts. While most of his peripherals look good, he struggled a little with the home run ball and command at Double-A. That isn’t terribly concerning, though, as he still struck out 12.3 hitters per nine innings with Tulsa. 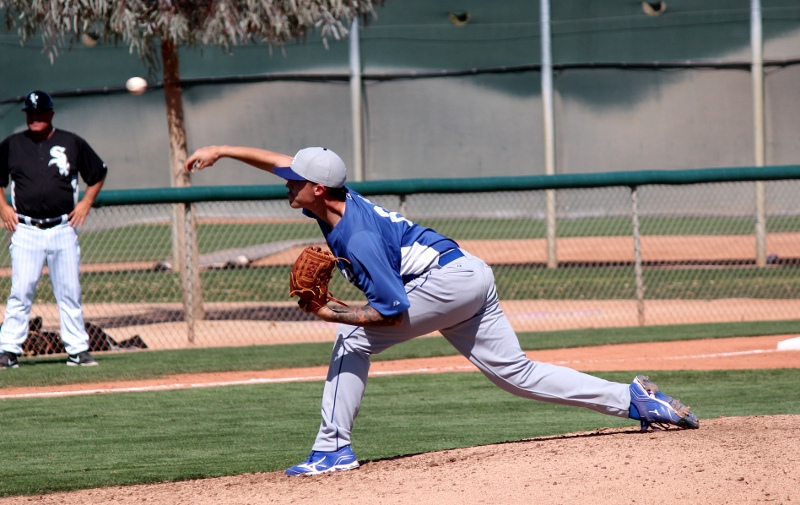 The PCL should be an interesting challenge for one of the Dodgers’ best pitching prospects. – Cotton’s season got off to a rough start as he suffered a fractured wrist in spring training. But after he came back from that, he was really good. 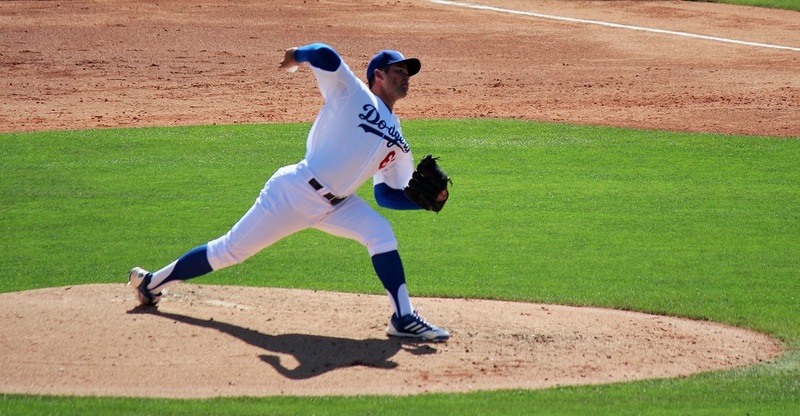 He pitched across four levels, spending most of his time at Double-A Tulsa. He baffled Texas League hitters with his low-to-mid-90s heat and plus-changeup. A late-season promotion to Triple-A looked like it might be the stepping stone to a call-up to Los Angeles, but that never came. Instead, he’ll pitch in the Arizona Fall League. – Urias didn’t have much trouble in the Texas League, but a decision to have cosmetic surgery on his “droopy” left eye kept him out for two months. Once he returned, he was good and even promoted to Triple-A. That’s where things fell apart. 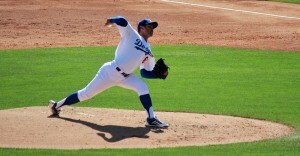 In 4 1/3 innings, he allowed 11 hits, nine runs, walked six and struck out five. He also pitched Game 2 of OKC’s playoffs and allowed six runs in an inning. That shouldn’t put a damper on his overall prospect status, but it was surprising to see him struggle as much as he did. He’s still the best pitching prospect in the organization. – Lee was the best pitcher Oklahoma City had this season. In fact, if he had qualified, his 2.70 ERA would have led the Pacific Coast League. This season was a stark difference to his first run through the league. Getting out of Albuquerque will do that for a pitcher. He struggled in his MLB debut against the Mets, but he still has a big league future in some capacity. – Holmes’ first taste of full-season ball was awfully successful. He was the best pitcher Great Lakes had all season, and as a 19-year-old, he showed some great signs of being a future No. 2 or 3 starter. The one things he struggled with — and it’s a biggie — is his command. His walk rate was too high and didn’t throw enough strikes at times. Still, he missed a lot of bats and did it with more than his fastball. He’s firmly entrenched as a Top-5 prospect in the system and will only keep moving up. – Rhame is the best true relief prospect in the system and is looking like a worthwhile former 6th-round pick. He has plenty of swing-and-miss in his repertoire. It isn’t a stretch to say he might see Los Angeles next season. His stuff will play at the next level. 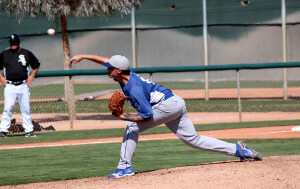 – Chosen one round ahead of Rhame in 2013, Underwood began his career as a starting pitcher, but a permanent move to the bullpen this season did wonders for performance and gives him better long-term potential. He doesn’t have particularly overpowering stuff, but he showed a much better feel for pitching as a multiple-inning guy. He probably won’t ever be a strikeout per inning guy, but he could be a serviceable middle reliever down the road. – It seems like Cash has been in the organization for a long time — because he has. He was the Dodgers’ 2nd-rounder in 2009. After a failed stint as a starter, he has been in the bullpen the last two seasons and has found a home. The main thing that gets him is his command, but he has shown swing-and-miss stuff in the past. That gives him a better chance to succeed in the majors than other prospects. – Dirks was acquired from the Braves along with outfielder Jordan Paroubeck (who should make this team in 2016) for international slot money. He came in and did nothing but pitch well between High-A and Double-A. He doesn’t have top-tier stuff, but a good middle reliever is the noblest of baseball professions. 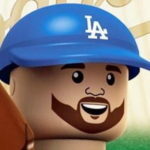 – Johnson is a shortish lefty who has shown the ability to miss bats. He does it with a high-80s/low-90s fastball and a slurve breaking pitch. He might just be an org arm at this rate, but he closed out the final game of the Cal League championship.